Rock Band is getting a powerful hit of Jimi Hendrix starting next week. No, we mean it this time. The Jimi Hendrix Experience's second album, Axis: Bold As Love, will be downloadable and playable starting on March 30. 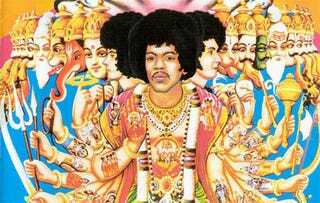 Harmonix and MTV Games will be releasing "a wave of downloadable content" from Hendrix's catalog, Rolling Stone has revealed, starting but certainly not stopping with Axis: Bold As Love, the 1967 album that features tracks such as "Spanish Castle Magic" and "Little Wing." The only track missing from the downloadable album is the opener "EXP." To make up for that, the previously unreleased single "Valleys of Neptune" from the posthumously released comp of the same name will also be coming to Rock Band. According to Rolling Stone, Harmonix and MTV have struck a deal that allows for downloadable Jimi avatars and props for Rock Band. Jimi Hendrix: Rock Band is still a possibility, despite Harmonix's previous dismissal of the its existence. The following tracks will be made available to Rock Band and Rock Band 2 owners starting March 30.